The winner of Janice Hanna Thompson's book is...please scroll to the end of the post. I wonder how Mary felt during the last month of her pregnancy, the time we celebrate during December as advent. And there are also many other things that Jesus did, which if they were written one by one, I suppose that even the world itself could not contain the books that would be written. Some scholars say Mary was around the age of fourteen when she heard the news. She may have endured accusations regarding her pregnancy before marriage. We aren't told what her family said, but we know she went to her cousin Elizabeth's house for the first three months. Perhaps this gave her family time to accept her. Toward the last days of her pregnancy, a census, mandated by Caesar, forced Joseph and Mary to travel from Nazareth to Bethlehem, about eighty miles. This journey included passages through mountains and hills. Nine months pregnant and riding on a donkey over dirt roads must have been so uncomfortable. Men and women travelled in groups, usually with relatives. Joseph and Mary probably couldn't keep up with the pace due to her condition and walked most of the journey by themselves. For any who have experienced the last month of pregnancy, you can imagine what she felt. In addition to her physical needs, her emotional drive would have been in want of a place for her baby. She travelled with the assumption they would stay in an inn and she would receive care. This we can take from Joseph's attempts to find an inn. He probably comforted her along the way with words like, "Don't worry, Mary. We will go to an Inn soon, and you can rest there." We can probably assume Joseph tried several inns before desperately pleading with the last innkeeper for accommodations and settling for anything, even a stable. Mary heard his efforts. 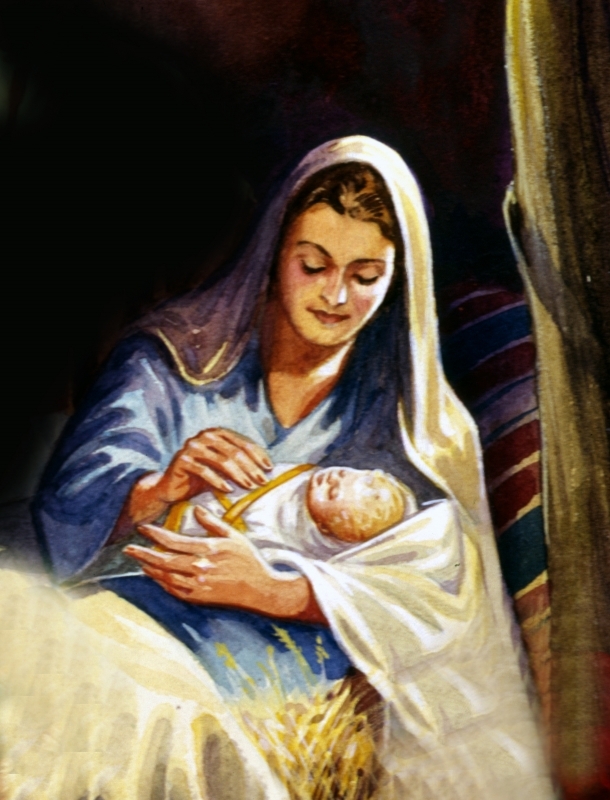 She proved her faith in the beginning of the pregnancy by giving the perfect response to the angel, but probably had concern for Joseph and his efforts to provide her and the coming baby a roof for the night. The pains set in. She didn't have a bed, nothing more than straw to lay on. Scratchy straw. Her baby was coming. The pains increased. She never had a baby before so each moment brought new sensations, questions, and agony. Her mother wasn't there to tell her how to breathe or to relax. Mary had probably seen other babies born, perhaps helped with the process. Knowing is different from experiencing, though. Sweat poured down her brow and she cried in pain. The baby, dear sweet Jesus, slipped from her body into the cloths waiting to be wrapped around him. He breathed his first breath. And Mary wept for joy. There is much more that could have happened. Help me paint a fuller picture of Mary, the one who mothered Jesus, with your ideas. What can you add? Mary knew this was to be a very special baby based on his conception. There had never been another like this one. Although she was pleased to be a servant of God in this way, she probably was afraid of just how different this baby might be. She would have questioned her ability to care for such a special one. Yet she would not give up her trust in God to enable her and Joseph to be good parents, the right parents, for this special baby. Even so, she probably felt relief when she finally held Jesus and saw that he appeared to be like any other baby that came from a mother's womb, pressed through the birth canal and crying from the first difficult path he had traveled. I have never really thought about her mother not being there. Or the things Joseph had been saying along the way. Good words. Especially, "pressed through the birth canal and crying from the first difficult path he had to travel." Wow. Great addition to our word picture of Mary and Jesus. So true. I think that is why God tells us to meditate on His word. It is in moment like these that we can draw closer to God. Thanks for your wonderful comment. I always wonder about the mix of emotions she must have felt. She saw an angel. An angel! But then the glory of that moment definitely probably faded into fear and self-consciousness under the likely accusations of others...such a whirlwind, I'm sure. And on top of it all, the knowledge that she was carrying God's son. Just crazy! I agree, Melissa. The honor and the expectation. All of those emotions you said plus first time pregnancy, and traveling. She has my deep respect.